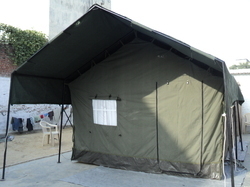 In tune with diverse markets demands, we are involved in exporting and supplying wide array of Jungle Safari Tent. Known for water proof and optimal durability traits, these tents are fabricated with use of best quality poly viscose fabric. Our offered products have PVC attached ground sheet, which makes them insect proof. Available with us in different sizes, we offer these tents as per clients' requirements. Looking for Safari Tent ?